Administrator Linda McMahon, head of the U.S. Small Business Administration, announced on March 16th, 2017, this year’s Small Business Person of the Year winners from the 50 states, the District of Columbia, Puerto Rico, Guam and the U.S. Virgin Islands. The Wisconsin winner is Wisconsin SBDC client Kristina Pence-Dunow, President & CEO, Double K, Inc., dba Hometown Trolley, Inc. of Crandon, Wisconsin. Hometown Trolley was also selected by SBA as a finalist for the “National Small Business Person of the Year” award. Hometown Trolley will join the other finalists on Monday, May 1st, for an awards luncheon where SBA Administrator Linda McMahon will announce the America’s “Small Business Person of the Year” for 2017. Combining 19th-century charm with 21st-century technology, Hometown Trolley has more than 2,300 cars in public and private transportation use, mostly in the United States, Canada and the Caribbean. Kristina Pence-Dunow, President and CEO, has led the company through a complete turnaround and modernization since 2010. Hometown Trolley acquired its major competitor, built a new 18,000-square-foot production facility and grew from 12 employees to 47. Sales have quadrupled since 2013 and are projected to increase through next year. The company’s growth can be attributed in large part to a commitment to innovations that include such “green” options as propane and natural gas, as well as the first all-electric, zero-emission model. Hometown Trolley also improved its appeal and accessibility with a “low boy” floor design that offers street-level boarding. Pence-Dunow worked extensively with UW-Green Bay’s Small Business Development Center for expansion and capital needs. 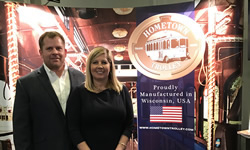 Congratulations Hometown Trolley on your “Small Business Person of the Year” win in Wisconsin and on being a National Finalist! To learn more about Hometown Trolley, click here. To learn more about the Wisconsin SBDC, click here.